Image of the Week — Hidden lakes in East Antarctica ! Underwater picture of englacial lake 4m below the surface [Credit: S. Lhermitte]. Who would have guessed that such a beautiful picture could get you interviewed for the national news?! Certainly not me! And yet, the photo of this englacial lake (a lake trapped within the ice in Antarctica), or rather science behind it, managed to capture the media attention and brought me, one of the happy co-author of this study, on the Belgian television… But what do we see on the picture and why is that interesting? The Image of this Week shows a 4m-deep meltwater lake trapped 4 m under the surface of the Roi Baudouin Ice Shelf (a coastal area in East Antarctica). 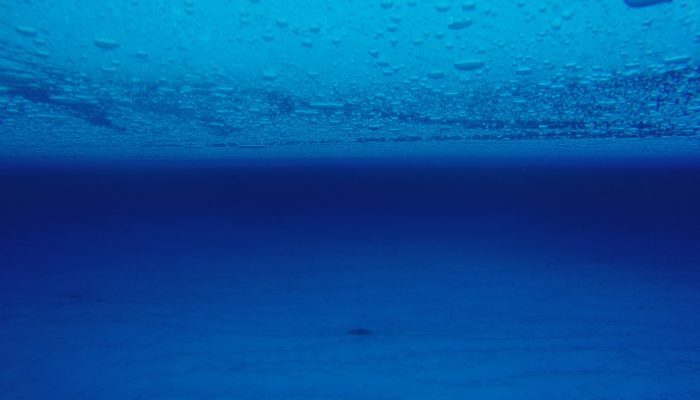 To capture this shot, a team of scientists led by Stef Lhermitte (TU Delft) and Jan Lenaerts (Utrecht University) went to the Roi Baudouin ice shelf, drilled a hole and lowered a camera down (see video 1). They warm the surface because the temperature of the air mass increases during its descent and the katabatic winds mix the very cold layer of air right above the surface with warmer layers that lie above. The combination leads to more melting of the ice/snow in the grounding zone — the boundary between the ice sheet and ice shelf — , which further darkens the surface and therefore increases the amount of solar radiation absorbed, leading to more melting, etc. (This vicious circle is very similar to the ice-albedo feedback presented in this previous post). All the melted ice flows downstream and collects in depressions to form (sub)surface lakes. Those lakes are moving towards the ocean with the surrounding ice and are progressively buried by snowfalls to become englacial lakes. Alternatively, the meltwater can also form surface streams that drain in moulins (see video 2). So far we’ve seen pretty images but you might wonder what could possibly justify an appearance in the national news… Unlike in Greenland, ice loss by surface melting has often been considered negligible in Antarctica. Meltwater can however threaten the structural integrity of ice shelves, which act as a plug of the grounded ice from upstream. Surface melting and ponding was indeed one of the triggers of the dramatic ice shelves collapses in the past decades, in the Antarctic Peninsula . For instance, the many surfaces lakes on the surface of the Larsen Ice shelf in January 2002, fractured and weakened the ice shelf until it finally broke up (see video 3), releasing more grounded ice to the ocean than it used to do. Of course surface ponding is not the only precondition for an ice shelf to collapse : ice shelves in the Peninsula had progressively thinned and weakened for decades, prior their disintegration. Our study suggests however that surface processes in East Antarctica are more important than previously thought, which means that this part of the continent is probably more vulnerable to climate change than previously assumed. In the future, warmer climates will intensify melt, increasing the risk to destabilise the East Antarctic ice sheet. Lenaerts, J. T. M., S. Lhermitte, R. Drews, S. R. M. Ligtenberg, S. Berger, V. Helm, C. J. P. P. Smeets, et al. 2017. “Meltwater Produced by Wind–albedo Interaction Stored in an East Antarctic Ice Shelf.” Nature Climate Change 7 (1). Nature Research: 58–62. doi:10.1038/nclimate3180. A few month ago, we were taking you on a trip back to Antarctic fieldwork 50 years ago, today we go back to Greenland during 1930s! The Permanent Court of International Justice in The Hague awarded Danish sovereignty over Greenland in 1933 and besides geopolitical interests, Denmark had a keen interest in searching for natural resources and new opportunities in this newly acquired colony. 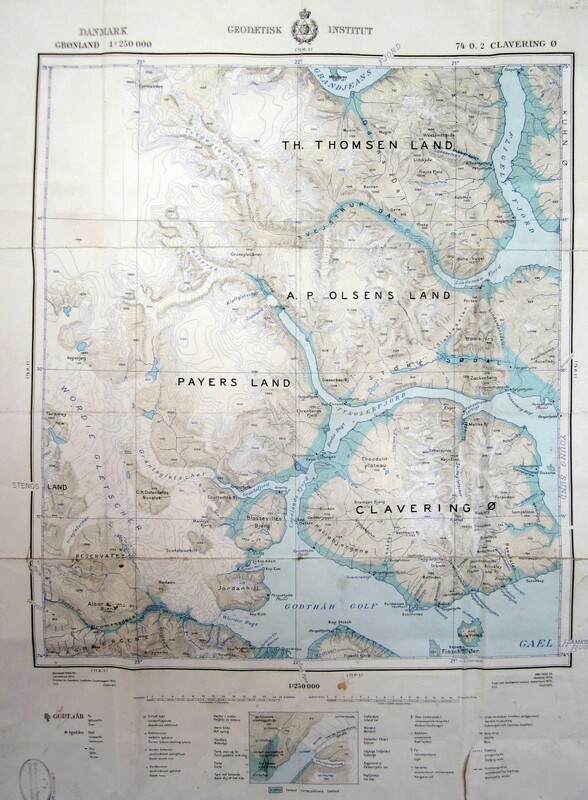 In the 1930s the Danish Government initiated three comprehensive expeditions; one of these, the systematic mapping of East Greenland, was set off by The Greenlandic Agency, The Marines’ air services, The Army’s Flight troops and Geodetic Institute. 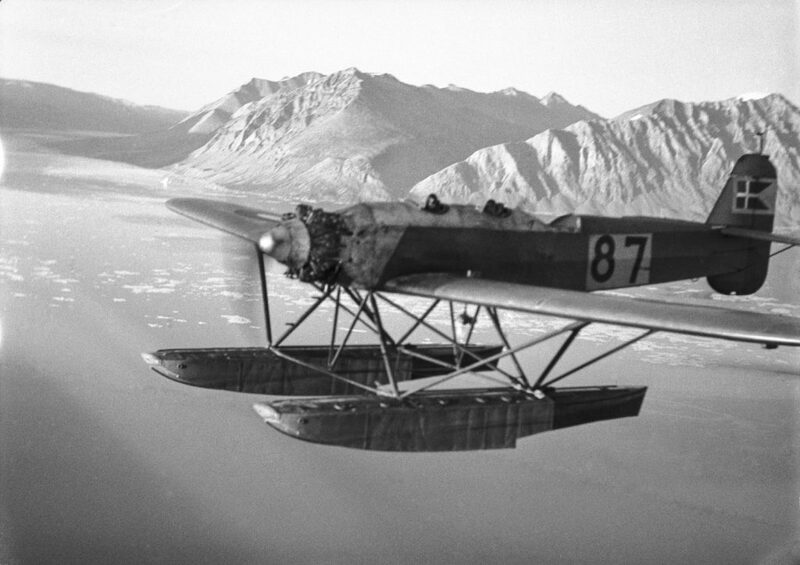 The Danish Marines provided pilots, mechanics, and three Heinkel seaplanes. The airplanes had three seats in an open cockpit. The pilot was seated in the front, the radio operator in the center and in the back the photographer – this seat was originally for the machine-gun operator. At the outset, the idea was to take vertical images, but that was impossible at the time due to the height of the mountains and the limited capability of the aircraft to reach adequate heights. The airplanes couldn’t reach more than 4000 m – similar to the height of mountains in Greenland. Oblique images were therefore recorded. The reduced view of the terrain when photographing in oblique angles required many more flights than originally planned. The photographic films were processed immediately after each flight. 45,000 km were covered during the first season, which lasted about two and a half months. In the following years, each summer a flight covered parts of the Greenlandic coast. During the Second World War, the mapping was temporarily stopped due to safety reasons. The tremendous volume of aerial images obtained from several expeditions and hundreds of flights not only constitutes the cornerstone of mapping in Greenland, but is invaluable data for studying climate change in these remote regions. The 1930s survey, compared to modern imagery, provides crucial insight into coastal changes, ice sheet mass balances, and glacier movement. Glacier fluctuations in southeast Greenland have been identified, showing that many land-terminating glaciers underwent a more rapid retreat in the 1930s than in the 2000s, whereas marine-terminating glaciers retreat more rapidly during the recent warming (Bjørk et al, 2012). 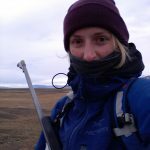 Mette Bendixen is s a PhD student at the Center for Permafrost in Copenhagen. 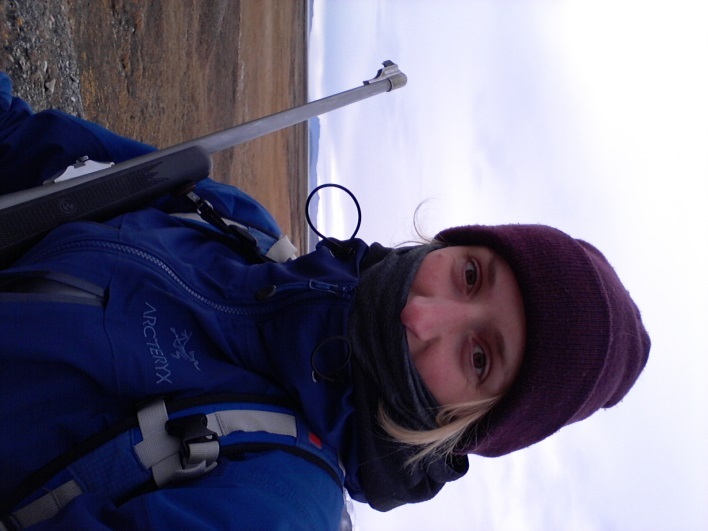 She investigates the changing geomorphology of Greenlandic coasts, where climate changes can have huge impact on the local environment. The use of drones or Unmanned Aerial Vehicles (UAVs) is one of the most exciting development in glaciology in recent years. The picture was taken during fieldwork conducted in the summer of 2014 by Johnny Ryan and colleague Nick Toberg. The aim was to survey Store Glacier once a day using a fixed-wing UAV, that was equipped with a digital camera, which took photos every two seconds during its dangerous 40 km sortie over the glacier. The project was a joint project between Aberystwyth University and the University of Cambridge, and the data provided insights into the process of calving and the interplay between the glacier and sea-ice mélange that forms during the winter and breaks up in late spring. 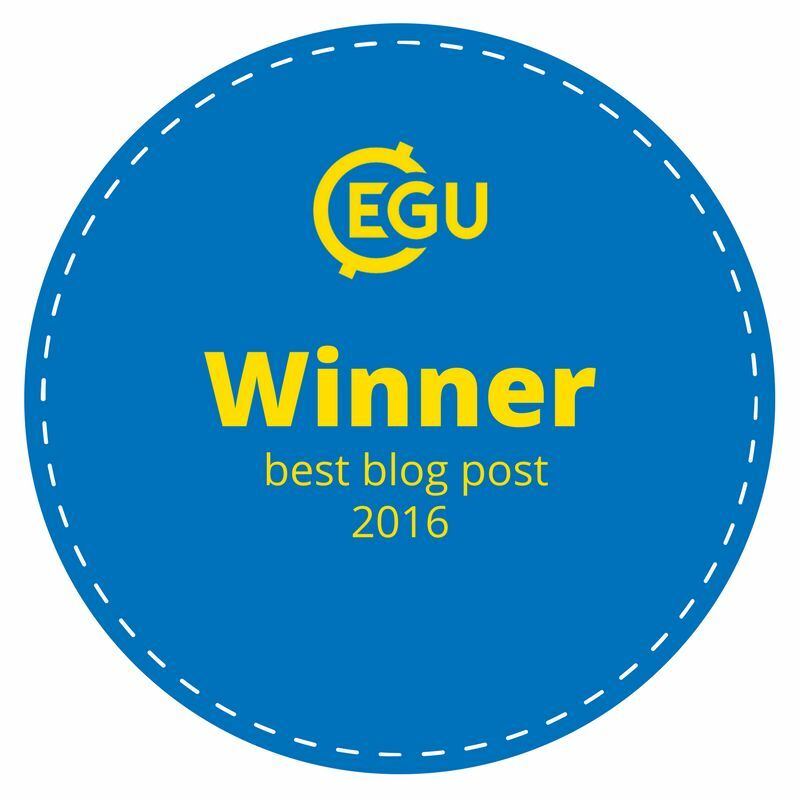 Read Johnny’s exciting blog post about the whole field season here. Results from the study has been published in the The Cryosphere earlier this year. The Muir is a valley glacier (Alaska) that has significantly retreated over the last 2 centuries. The 3 pictures have the same field of view and record the changes that occurred during the 63 years separating 1941 and 2004. 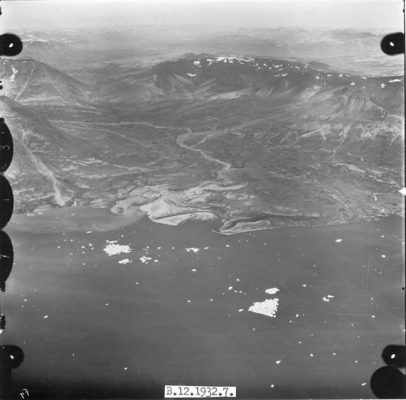 In the 1941, the terminus of the glacier is on the lower right corner of the photo. The Muir is then a tidewater glacier up to 700m thick and is well connected to its tributary, the Riggs Glacier (upper right part of the photo). 9 years later, in 1950, the Muir Glacier has retreated by more than 3 km, is more than 100m thinner but is still connected to Riggs Glacier. By 2004, the Muir glacier has retreated further inland and its terminus is no longer visible on the picture. The Riggs glacier is now disconnected to the Muir and has retreated by 0.25km. Vegetation has invaded the place. The photo comes from and the text is inspired from the section “Repeat photography of the Alaskan Glaciers” on U.S. Geological Survey website. Photo 1: W. O. Field, # 41-64, courtesy of the National Snow and Ice Data Center and Glacier Bay National Park and Preserve Archive. Photo 2 : W. O. Field, # F50-R29, courtesy of the Glacier Bay National Park and Preserve Archive. Under the Hochjochferner glacier. Credit: Ilkka Matero. 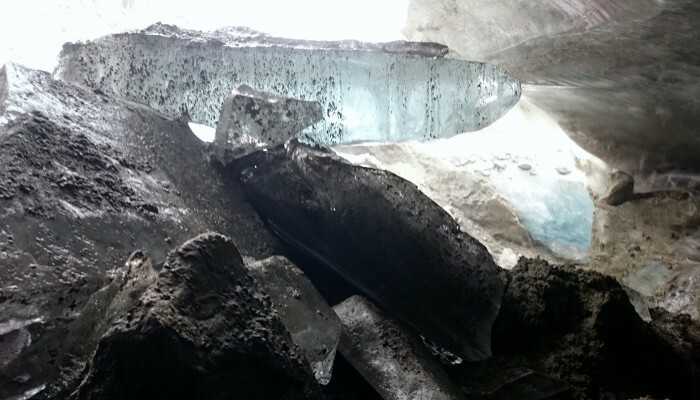 What is happening under a glacier? This is a difficult questions to answer as accessing the glacier bed is usually not that easy. Here, we are getting a rare glimpse of the different processes and materials that are often found at the ice-bed interface. The photograph shows both sediments and hard rock, clear ice and dirty ice, and of course flowing water. No wonder these processes are complicated to say the least! The photo was taken by Ilkka Matero (University of Leeds, U.K) during the excursion to Hochjochferner at the Karthaus summer school. See also the Image of the Week post from 18th of September to get an outside view of the side of the glacier. This image is from the west coast of Greenland and it shows several glaciers flowing towards the sea (upper part of the image), transporting ice into the ocean. The colours show the velocity of the ice. As the ice gets nearer to the coast it speeds up reaching speeds over 15m/day. The velocities were calculated using two Sentinel-1A radar scans from 3 and 15 January 2015. You can download a high resolution version of the image on the ESA website. This is the first installment of our new “Image of the Week” feature. If you have an image or a photograph that you would like to see on the Cryosphere blog, please get in touch! – In fieldwork, you have no average. You just have extremes. When Daniel spoke his mind out loud we were facing a bright sunny day coming in from the opening of our tent. We were very glad to see that and ready to engage with our glaciological tasks. 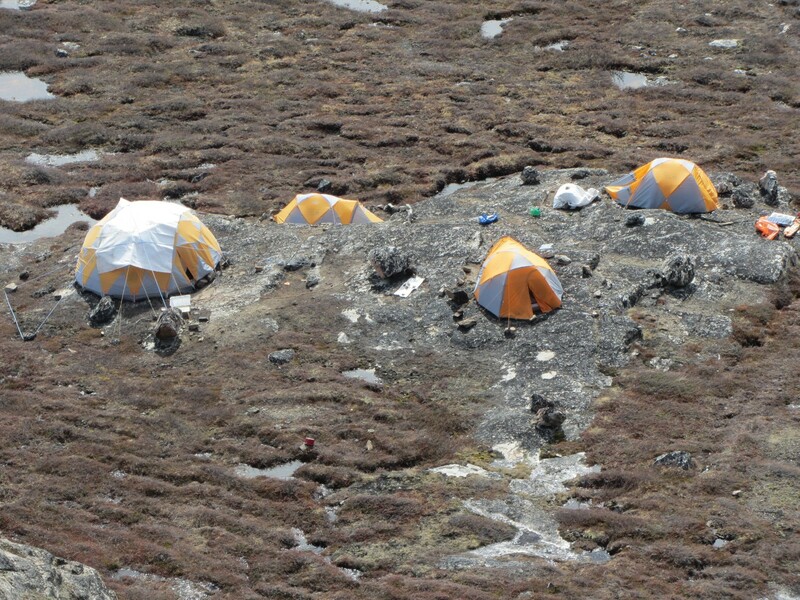 Our camp site was at the immediate fore field of the A. P. Olsen ice cap in Northeast Greenland. We had arrived there the previous evening and had two days left to spend for our science up on the ice. But, on Saturday 30 August, we had to return to Tyrolerfjorden, no-matter-what. 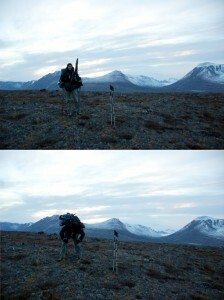 It had to happen in one-go, which means a 12-hour hike, 30 kilometers, carrying everything. Our appointment with Kenny was 00:30 hours at its narrow coast, so he can provide us a safe passage with the boat back to the ZERO station. The weather was closing in again on Sunday and with four days of supplies left, we just had to make things happen. Daniel’s statement is very funny because it is actually very much true. 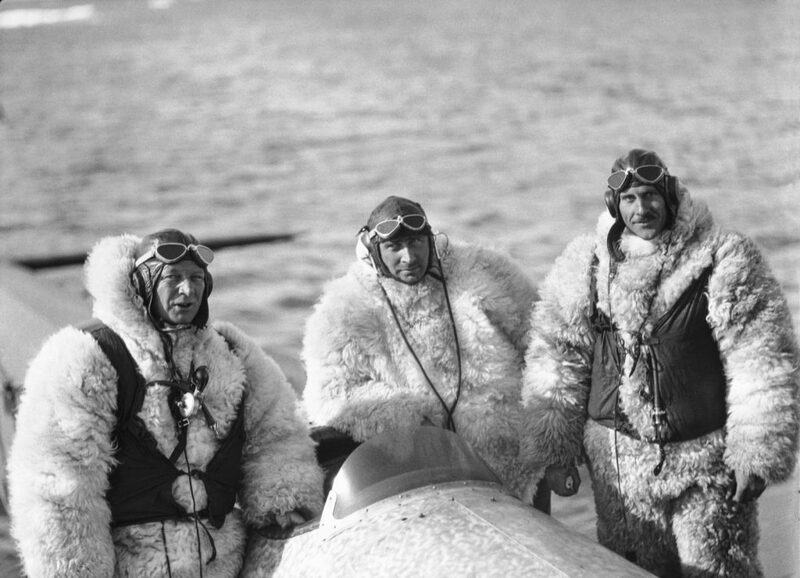 Polar scientists always post their greatest photos, where they look like awesome polar explorers, implying that everything was completed like piece-of-cake. I do that too. But, there is always the other side of every story. Any fieldworker in the Arctic can verify that no matter how much experience you have or how hardened you have become through the years, every new mission is absolutely unique and different in many ways from all the previous ones. You have to prepare yourself the best way you can and when the time comes, perform your absolute best. Then, you have to also just hope for the best. 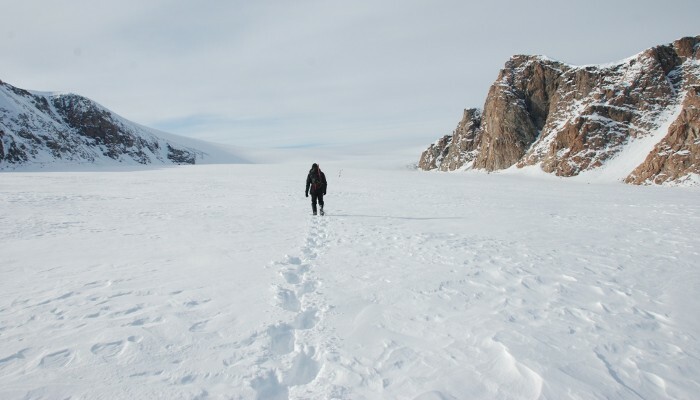 When we began the first part of the mission on Freya glacier, the reality was quite different from our expectations. 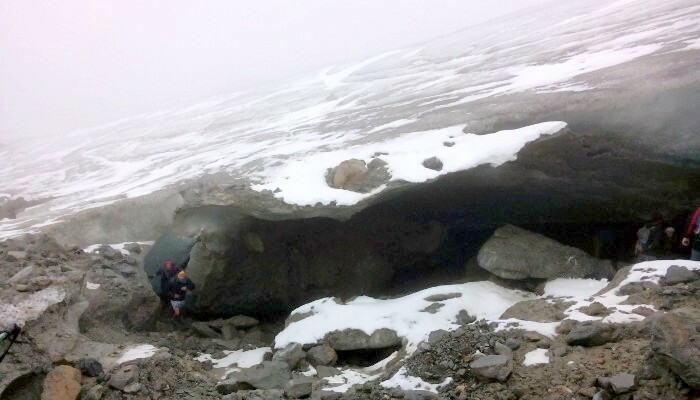 The biggest part of the glacier was still covered in snow. We were glad to see that, since it implied a positive mass budget year for Freya. On the other hand, since this was unexpected and we didn’t have our snow shoes with us, every step that we made was a struggle with the snow cover trying to swallow our legs while we are carrying all our equipment. Myself, I am what Daniel calls a “spoiled glaciologist”. Lightweight guy, I am definitely not as strong as he is, always riding on helicopters, twin otters and ski-doos. Seeing this genuine mountaineer also exhausted at the end of that first day on Freya made me feel a bit better about my performance. Of course, he was carrying about 10-20 kilos more on his back. Nevermind that. Map of the wider region of Zackenberg (Geodætisk Institut). Sleeping on the side moraine of Freya inside bivouac sacks was also a new experience for me. We were glad not to experience fierce weather, so it was overall not too bad. But the fact is that in a bivouac, you end up quite quickly in a pool of liquefied water vapor that rains down on your face. Remedy is not too easy since as soon as you open the sack, you are exposed to the freezing glacial air. Fever in the morning was guaranteed for me. Back at the ZERO station and before the hike to A. P. Olsen land, our preparations definitely included snow shoes. The previous days on Freya, we were able to spot the Argo glacier, the East-flowing glacier of the A. P. Olsen ice cap, on the horizon. It seemed to have an extended ablation zone with no snow cover, but since our plans included a visit in the upper GlacioBasis station, we thought that snow shoes would come in handy. As it turned out that was a really wise decision. On Saturday 23 August we began the second part of our mission. Kenny and Lars dropped us off with the boat at the north coast of Tyrolerfjorden, west of Zackenberg and opposite of Eiger on the Clavering island. The weather was not inviting, cloudy atmosphere with small droplets falling now and then, but nothing too alarming. Our greatest concern at that time was crossing successfully the river at Store Sødal that may or may not be raging and full of water. As it turned out, crossing the river was not too challenging, since the flow at the end of the summer season is significantly reduced. But, the persistent cloud cover had gotten very thick by early evening and resulted in rain and eventually a storm. Hard tasks and rewarding views (Credit: Babis Charalampidis). While being in the proglacial valley of the Argo glacier, we were still closer to Store Sødal than to the ice cap when we decided to set camp and take shelter from the storm. We were definitely glad to get a bit dry, but we knew that this was a far from ideal situation. In this region, a lot of furry animals like to hang out. Snow foxes, arctic hare, but also bigger ones: muskoxen, polar bears… Any close encounter with them was far from our desires and although we were equipped with a flare gun and a rifle, one always prefers to return them unused, when one gets to return. We could only hope that our training and instinct would serve us well, should the circumstances require it. Sleeping in the tent was frustrating. Every noise from outside – the wind, rock falls, the river – were keeping us from relaxing and enjoying our sleeps. In the morning, the storm was still going on. What we couldn’t have guessed at the time is that it would last for more than three days. Our initial awareness turned into prolonged sleeping sessions. In the interest of carrying less weight, we didn’t have with us any books or card games. Our daily routine included frequent chats during coffee times that intervened between our 2-3 hourly naps. A big moment every day, was 8 pm when we would call Kenny to let him know we’re doing fine and learn the weather forecast. Sadly, we had to hear the words: “Still stormy forecast, boys” quite a bit. The mood would catch up later in the evening when we would have our modest dinner and finish the day with cognac and cigarettes. Good times, bad times (Credit: Babis Charamlapida). The time came when we heard good news: “Tomorrow, Wednesday 27th at noon sky clears up, boys”! And so it did. But, hiking after such a prolonged period in horizontal position was not something to derive pleasure from. By the end of that day, exhausted as we were, we managed to set camp at the very front of the glacier. Having wasted three days of supplies, we knew that we wouldn’t make it to the upper station. But, also one glimpse at the glacier predetermined that we will be slow again: The rain storm at the bottom of the valley was in fact a snow storm at the ice cap. The snow cover was everywhere at least half a meter and although we would be faster than on Freya with the snow shoes, we wouldn’t be as fast as we had hoped. We successfully completed most of our tasks on A. P. Olsen and we definitely enjoyed this expedition. The scenery is always breathtaking and after all, this mission was more like an adventure of two friends than conventional glaciological fieldwork. But, it is also a fact that we overworked ourselves. Last day on A. P Olsen and last hours of hike the next day before our pick-up from Tyrolerfjorden (Credit: Babis Charamlapida). It is always good to remember that some moments throughout the process can be quite tough. In the end, this is probably the case with everything in life. The journey teaches you a few things. I will never forget the pain all over my body after the last hike from the ice cap to Tyrolerfjorden, racing against the clock on very challenging terrain with full backpacks. I will never forget the sense of trust that was developed between me and Daniel, how well we collaborated, coexisted and in a sense completed each other on this trip. Finally, I will never forget to have always a small book and a deck of cards with me. Babis Charalampidis (GEUS/Uppsala University) is an Uppsala University PhD student within the SVALI project, based at the Geological Survey of Denmark and Greenland and supervised by Dirk van As. He is interested in the Greenland ice sheet’s mas budget, particularly the link between energy balance and subsurface processes such as percolation and refreezing. He studies the changes of the lower accumulation area of the southwest of the ice sheet in a warming climate, based on in situ observations. In the summer of 2014, our group at Aberystwyth University and the University of Cambridge decided to pursue an ambitious but exciting field campaign in West Greenland. 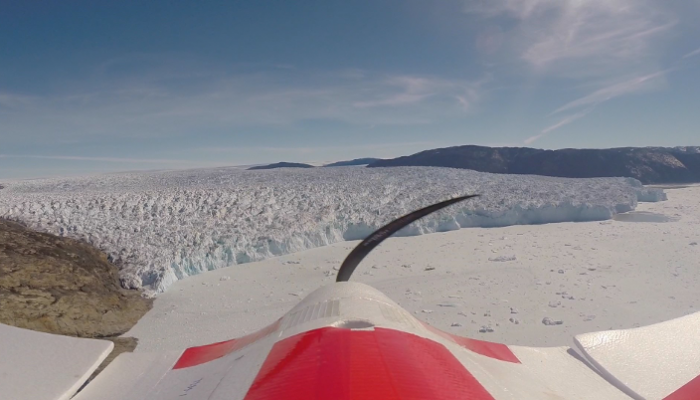 The aim was to survey Store Glacier once a day using a fixed-wing unmanned aerial vehicle (UAV) (see photo above for a view from the UAV on its way back from a mission with Store Glacier, West Greenland in the background). The UAV is equipped with a digital camera, which takes photos every two seconds during its dangerous 40 km sortie over the glacier. 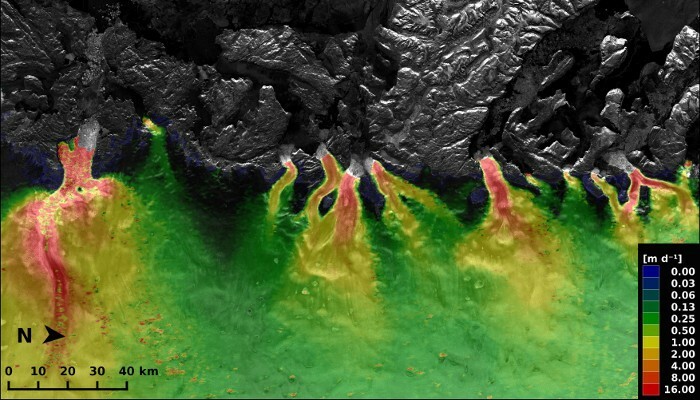 These photos can be stitched together using multi-view stereophotogrammetry to produce high-resolution orthoimages and digital elevation models of the glacier. We hope to use the data to provide insights into the process of calving and the interplay between the glacier and sea-ice mélange that forms during the winter and breaks up in late spring. 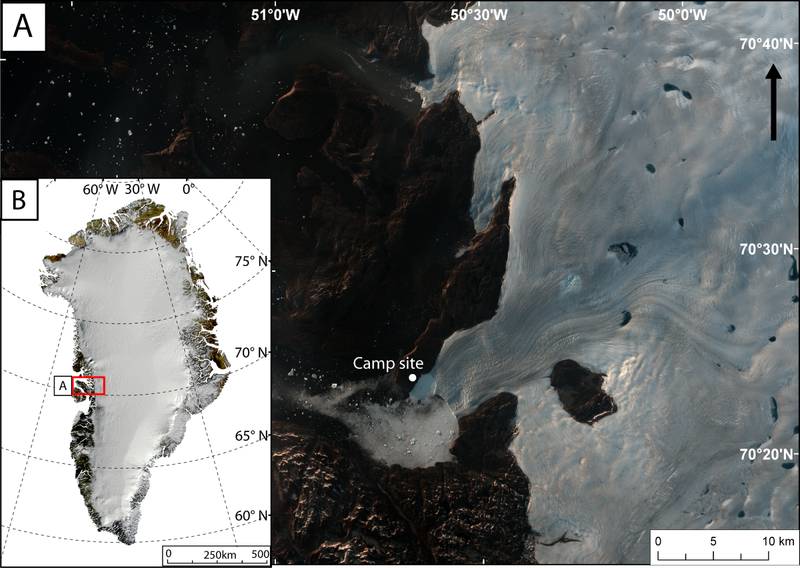 A) Landsat 8 true colour image of Store Glacier in August 2014 with the location of camp site. B) MODIS mosaic image of Greenland (Kargel et al., 2012, The Cryosphere) with location of Store Glacier which is situated in Uummannaq Bay. The field campaign started on 7th May 2014 when my colleague, Nick Toberg, and I were dropped off by a helicopter on a peninsula by side of Store Glacier. This site was to be our home for the next 10 weeks and as we watched the helicopter disappear down the fjord, there were not two lonelier men on Earth. Temperatures dropped quickly to -20 degrees as the sun set behind the mountains so it was important to set up camp and prepare for a chilly first night. We were well provided for, with a large mess/science dome tent, individual sleeping tents, generators, a stove, kerosene heaters and a table and camping chairs. By the 9th May we were ready to start flying missions over Store Glacier. 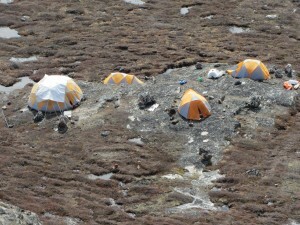 The camp with sleeping tents and mess/science tent. Generators and solar panels were used to charge laptops and UAV LiPo batteries. A typical day would consist of a lazy breakfast, followed by some reading or hiking during the morning. We would then have lunch and aim to fly the UAV at 3pm. Setting up the UAV took a few minutes and a typical survey would take 30 minutes. At the start of the field campaign, these 30 minutes would seem like a lifetime and we would usually be too worried and agitated to think of anything but the plane. I would pace up and down trying to remember whether I had checked a certain part or become increasingly nervous about the wind speed, which always seemed to increase as the plane started its mission. As time passed and more data was collected, we became more and more relaxed. 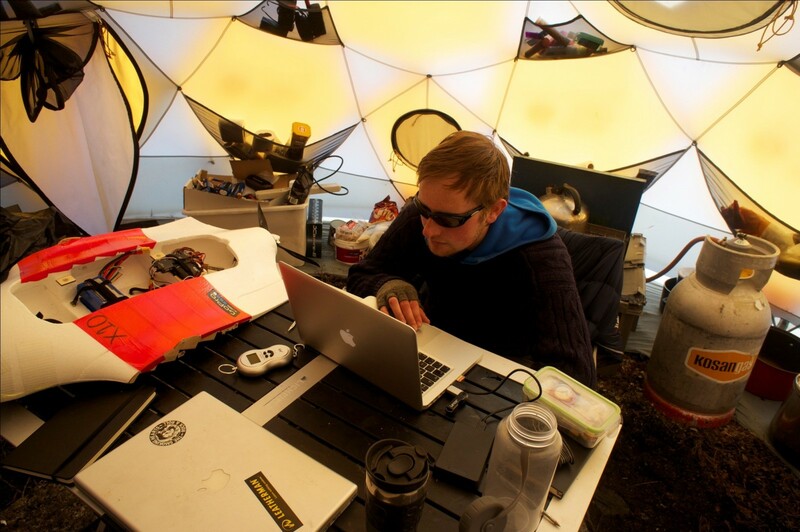 We got to a point where, once the UAV was launched, we would go straight back into the mess tent and read our books. Then once, we heard the plane over our heads, we would head out and land it. Inside the mess tent. Downloading the GPS, attitude and the locations of the camera triggers from the flight controller. Once the plane was safely landed (see video below), which was difficult on the short, boulder-strewn runway, the photos would be downloaded from the SD card and the log files from the flight controller (see photo above). We would then check for damage and repair anything that needed fixing. Cooking and washing up duties were rotated every evening and we would watch a film (usually something starring Nick Cage) after dinner. After the film, we would head to our individual sleeping tents. There was something magical about brushing your teeth overlooking Store Glacier below, the Greenland Ice Sheet to the east and the beautiful fjord and rugged mountains to the west. 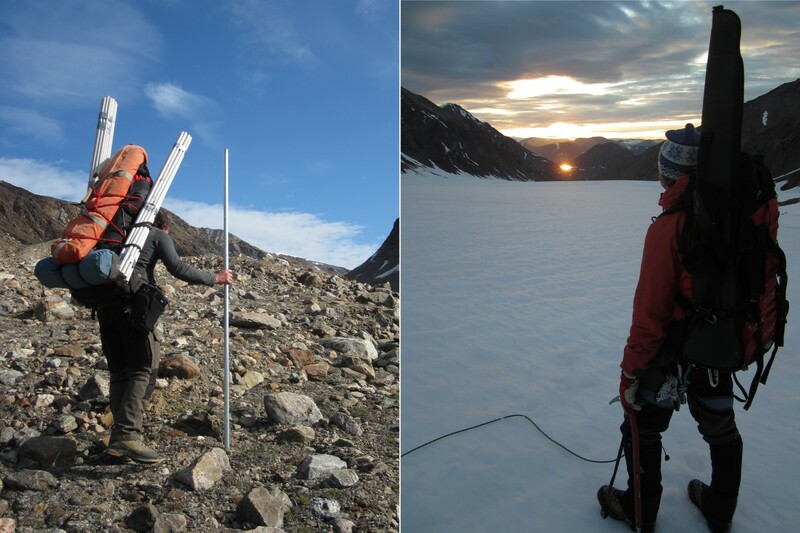 In total we completed 55 surveys of Store Glacier from early May to late July. Nick and I are still friends and are now processing the data. We hope to be able to provide some exciting results soon. Johnny Ryan is a PhD student working at Aberystwyth University in Wales and is supervised by Prof. Alun Hubbard. He is interested in understanding the dynamics of the Greenland Ice Sheet and its fast flowing tidewater outlet glaciers. The primary tool Johnny uses for his research is a fixed-wing unmanned aerial vehicle (UAV) which can be used to survey the cryosphere at fine temporal and spatial scales. 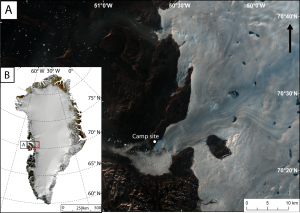 Currently he is using data collected by UAVs combined with timelapse camera imagery, meterological stations and tide gauges to investigate processes that control calving and the break-up of the ice melangé at Store Glacier. Johnny tweets as @glaciology_uavs .